Takada: Mentioned in news report. Airbag supplier Autoliv reportedly accused competitor Takata Corp. of withholding the information Autoliv needs to make a bid to purchase the troubled company. It is another sign of trouble for Takata as it looks to find a suitor, compensate automakers and pay off debts. 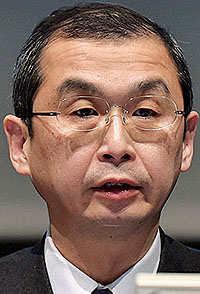 Takata CEO Shigehisa Takada threatened to fire employees who gave Autoliv, its Swedish competitor, information it requested on Takata's finances and recalls, The Wall Street Journal reported Tuesday, Jan. 24, citing people familiar with the discussions. Autoliv reportedly made the complaints to the steering committee overseeing Takata's restructuring. An unspecified number of automakers, in line for large payments from Takata, also have complained to the committee about Takata's handling of Autoliv, the Journal reported. It was unclear how much Autoliv's complaints could impact the bidding and restructuring process for Takata. Requests for comment from Autoliv were not immediately returned. Takata declined to comment. It could, however, prove to be a boon for Key Safety Systems Inc., also in the running to buy Takata. According to the report, Chinese-owned Key is in "advanced discussions" with private equity firm Bain Capital to bid for the company, and it could partner with Japanese supplier Daicel Corp. on a bid. A spokesman for Key did not immediately return a request for comment. Key was acquired in 2016 by China's Ningbo Joyson Electronic Corp. in a $920 million transaction. Takata executives worry that an Autoliv purchase would be shot down by regulators, as the two companies combine to supply more than half the global market, the Journal reported. Autoliv reportedly hired a former U.S. Justice Department antitrust lawyer in an attempt to put Takata's antitrust fears at ease, though Autoliv said Takata played down those concerns in a fall meeting. The report came about a week after 13 automakers, including BMW, Nissan and Tesla, recalled a combined 652,000 U.S. vehicles with Takata airbags to replace front passenger inflators. About 42 million vehicles in the U.S. alone are expected to be called back eventually as part of the largest safety recall in the history of the auto industry. Takata's faulty airbag inflators have been linked to 16 deaths worldwide, in addition to about 180 injuries in the U.S. alone. An inflator can explode, breaking a metal canister and shooting shrapnel throughout the vehicle's interior. The company in mid-January agreed to pay $1 billion and plead guilty to criminal wrongdoing as part of a settlement with the U.S. Justice Department. The penalty comprises $850 million in compensation for automakers, $125 million in compensation for victims and a $25 million criminal fine. As part of the deal, Takata had less than a month to pay the victim compensation and criminal fines, and it must compensate automakers within a year. Additionally, a federal grand jury indicted three former Takata executives on suspicion of fraud and conspiracy for allegedly convincing automakers while at the company to buy "faulty, inferior, non-performing, non-compliant or dangerous inflators through false reports."